Bubby and Bean ::: Living Creatively: 12 Delicious Summer Recipes + a Giveaway from Lee Kum Kee Sauces! It's June, which in my eyes means it's officially summer. Along with plans for a whole lot of outdoor activities in the coming weeks, I also have plans for a whole lot of summertime food. In celebration of this, I've rounded up 12 delicious summer recipes, all of which are listed below. For the 8 of them that are my (vegetarian!) favorites, I've written them out in full (with ingredients, directions, and all). Below them are 4 more for you meat lovers out there, with links to their full recipes. The best part is that if you wanted, you could just come back to this blog post for almost the next two weeks and have a new summery recipe to try every single day. Wooot! In addition to being summer-themed, each of these recipes also incorporates sauces from Lee Kum Kee, maker of some of the most delicious Asian style condiments I've ever tasted. While best known for its signature soy sauce, Panda Brand Oyster Flavored Sauce, and chili sauce, Lee Kum Kee offers more than 200 authentic Asian sauces and condiments that use only premium quality, non-GMO ingredients. They also offer several gluten-free sauce options, and (lucky for me), their sauces work amazingly well with a huge variety of vegetarian foods. Lee Kum Kee has also been around since 1888 (wow! ), and has a presence in more than 100 countries and five continents. Once you browse through all of these delicious recipes and decide which ones you'll be making this weekend, scroll down to the bottom of the post where you can enter a giveaway to win $50 worth of Lee Kum Kee sauces of your very own. Score! 1. In a small bowl, combine Plum Sauce, water and lime juice (plum dipping sauce). Microwave for one minute and set aside. 2. In a medium mixing bowl, beat egg. Add in beer and the remainder ingredients (beer batter mixture). 3. Whisk mixture until smooth. Refrigerate for 30 minutes. 4. Coat asparagus with beer batter mixture one at a time. 5. Dip fry asparagus until golden brown. 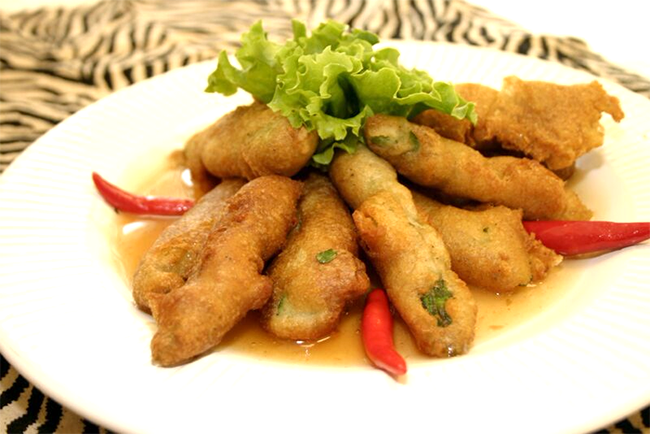 Serve with plum dipping sauce. 1. Cut cabbage into quarters, then slice thinly. 2. Trim both ends of the jalapeño, cut in half lengthwise, and remove seeds. Then thinly slice across, forming crescent-shaped strips. 3. Prepare the sweet peppers the same way as the jalapeño. 4. In a bowl, toss together cabbage, jalapeño, sweet peppers, salt, sugar, and mix well. 5. Add apple cider vinegar and Sriracha Mayo, mix well. 6. Garnish with cilantro leaves and masago. Note: Grilled shrimp also goes well as a garnish for this salad. 1. In a small bowl, combine chopped parsley, beaten eggs, ricotta cheese, parmesan cheese, mozzarella cheese, tomato sauce and Chili Garlic Sauce (mixture). 2. On a skillet, season all vegetables with salt and pepper and 2 tbsp. olive oil. Grill vegetables untilcooked. 3. In a greased half-sheet pan, assemble flour tortillas, vegetable, and mixture. Cover with aluminum foil. 4. Bake at 375F for 45 minutes. Remove cover and bake for another 15 minutes. 1. In a small mixing bowl, combine Premium Soy Sauce, black pepper, Sesame Oil and lime juice. Mix well and set aside (soy sauce mixture). 2. Season vegetables with black pepper. Drizzle olive oil and toss well. 3. Grill vegetables and tofu for 5 minutes on each side. 4. Serve with soy sauce mixture. 1. In a mixing bowl, combine Sesame Oil, Chili Garlic Sauce, lime juice, parsley and Premium Soy Sauce (mixture). Set aside. 2. 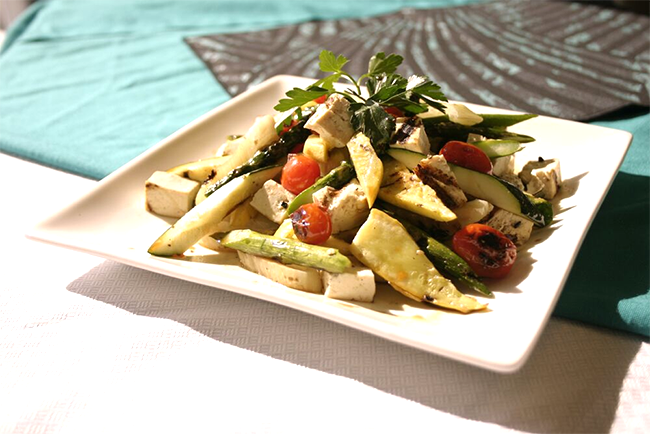 Drizzle olive oil onto the vegetables then grill on both sides. 1. Toss halved baby potatoes, Lee Kum Kee Sriracha Chili Ketchup and olive oil in a large bowl. 2. Spread in baking dish and roast at 450 F for 20 minutes. 1. 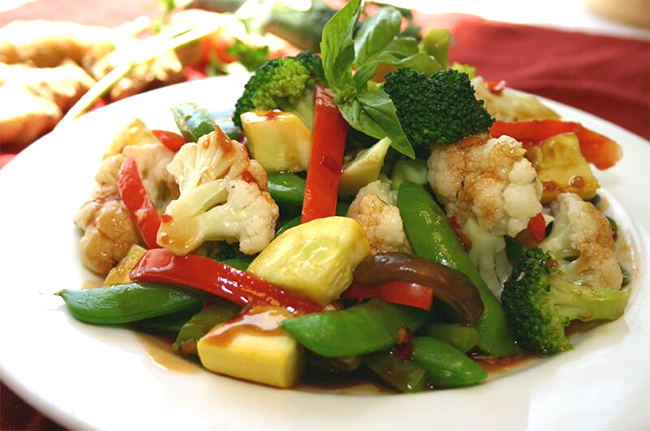 In a heated pan with oil, stir-fry vegetables for 5 minutes. 2. Stir in Hoisin Sauce, Premium Soy Sauce and water. 3. Cook mixture for another five minutes. Mix well and season with black pepper. 1. Saute garlic in 1 tbsp oil. Add all ingredients (except lettuce) and stir-fry for about 2 minutes. 2. Stir in sauce mix and cook through. 3. Wrap filling with lettuce leaves and serve at once. AND NOW FOR THE GIVEAWAY! One lucky Bubby and Bean reader is going to win an assortment of Lee Kum Kee sauces, including those that are highlighted in the recipes above, for a total value of $50. To enter, just use the form below. There are several ways to gain entries. Giveaway will run through June 16th and is open to Bubby and Bean readers worldwide. The winner will be randomly chosen and announced here shortly after. Who else is excited for summertime recipes? Which recipe above would you most want to try? This post is in partnership with Lee Kum Kee. Thank you for supporting Bubby and Bean by allowing me to post accessional sponsored content. I'd most like to try the Sriracha mayo! Yum! Thanks for the chance! You had me at beer battered asparagus... Yum! Everything tastes better in summer :) I love anything that can go on the grill this time of year! The chili garlic sauce sounds amazing. So do all these recipes. Great giveaway! Ten with a side of five please! I don't have time to enter the giveaway just yet, but I wanted to say that the grilled corn in no.12 looks amazing. Now I want some grilled corn! I'd love to try the Hoisin Sauce! Also the beer battered asparagus looks amazing. I too would like to try the Garlic Hoisin Sauce! The Satay sauce would be good too. I would love to try the Shrimp Sauce. Garlic Hoisin Sauce sounds delish! I'd like to try the XO sauce. That beer battered asparagus with plum sauce looks so good, I would also like to try the garlic hoisin sauce and peanut sauce. I want to use the Chicken Boullion Powder. I would go for the Satay Sauce (first off). Chili garlic sauce sounds delicious!! I would like to try Sriracha Mayo. all the recipes seem so delicious. I hope i can make it at home.